Last Thursday when I launched my new author site (which I'd love for you to visit! 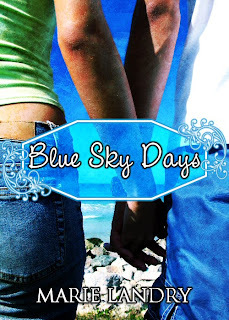 ), I celebrated by posting a short teaser for Blue Sky Days. This week, I’m going to post an excerpt so you can get a better idea of the story, as well as my writing style. I hope you enjoy it, and I’d love to hear some feedback! There was a delightful breeze moving across the field, unhindered by buildings or trees. It rippled across the low-lying greenery surrounding the strawberries, sending the mouthwatering scent of ripe berries into the air. The wind moved around us, teasing the hem of my shirt and ruffling Nicholas’s hair so that it fell forward across his forehead, giving him a slightly roguish look that had my fingers itching, as they had before, to touch his hair. To touch him. We worked away in silence until the container between us was full. Nicholas plucked one more strawberry from the vine and held it out to me. When I reached for it, he shook his head and held it to my lips. My stomach tensed as I leaned forward to take a tentative bite of the berry, careful not to graze his fingers with my teeth. I laughed when juice spurted from the ripe berry and rolled down my chin. When my eyes met Nicholas’s, expecting him to be laughing too, his face was serious, his eyes intent on my mouth. I licked my lips self-consciously and wiped the juice from my face with the back of my hand. Nicholas’s gaze lingered on my lips a minute more before meeting my eyes as he popped the rest of the berry in his mouth and smiled slightly. “Sweet,” was all he said as he stood. He moved around, working the kinks out of his legs before stretching, arms reaching up toward the sky. “Where’d those clouds come from?” he asked. “Sure looks like a storm.” Nicholas stood there, his face upturned, and watched the clouds pick up their pace across the sky. He wiped away a fat raindrop that fell on his arm, and had just opened his mouth to say something when the sky seemed to burst open and pour sheets of rain down on us. I let out a surprised shriek as the cold raindrops hit my face. My first instinct was to run for shelter, and I turned in the direction of Farmer Milligan’s old red barn to do just that when Nicholas grabbed my hand and held me where I was. “Stay!” he yelled over the noise of the heavy rain pounding on the ground. “Feel it. Enjoy it.” He took both my hands and turned them over, holding onto my wrists so I could feel the rain slip through my fingers and see it puddle in my palms before it overflowed and slid down to drip onto the earth. As it washed over my face and hair, drenching my clothes so that they clung to my body, I turned my face toward the sky again and closed my eyes. When the rain started falling harder than I thought it possibly could, I began to laugh. I had never seen it rain so hard in my life. It was coming down so thickly that when I opened my eyes to look at Nicholas, who was no more than two feet away from me, even he was blurred. When he saw that I was laughing, a quick grin spread over his face. I couldn’t stop, and he started to chuckle, too. He let go of my hands and put his arms around my waist to pick me up and spin me around. I giggled harder as the rain flew from his hair. Closing my eyes, I buried my face in his neck, feeling dizzy but not from being spun. When my feet hit the ground again, Nicholas kept his arms around my waist. The rain let up slightly, but was still coming down in buckets with the sound of it drowning out all the previous springtime noises—the birds chirping, the insects buzzing, the occasional far-off sound from the park. It was like we were in our own little rain-soaked world, the downpour creating a curtain of water around us that blocked out everything else. Nicholas pushed a few strands of wet hair away from my face. Droplets of rain clung to his eyelashes and dripped from his hair. His mouth was curved into a hint of a smile, his eyes locked on mine. When his body shifted to lean toward me, my knees began to shake and I worried that I would melt into a puddle and wash away with the rain. He paused, his lips lingering close to mine, barely touching, but just enough to have my lips tingling in anticipation. This was it; I was about to have my first kiss, and it just happened to be with the most beautiful boy in the world. Nicholas laughed under his breath as I sighed, and when he finally brought his mouth to mine I was glad he still had his arms around me so my quivering knees didn’t land me in a heap right there in the middle of the field. The kiss was slow and soft, mingled with the barest hint of strawberry sweetness as our lips parted and our tongues met. I knew I would never forget this moment—the feel of the rain as it slid over my skin; the way Nicholas’s hands moved to cup my face; the pungent smell of soaked strawberries and earth. As I clung to Nicholas, the rain washing over us, I knew that everything would be different from that moment on. I may have been nineteen years old, but my life was really just starting in many ways. This was another new beginning: right there in Nicholas’s arms, in the middle of Farmer Milligan’s strawberry patch. Marie? I know can't wait even more than I already couldn't wait to read this! I think I can already relate to Emma, and Nicholas seems very swoon-worthy. I am SO excited for your novel! Oh... my... gosh.... That was awesome!